Welcome to Day 2 of the winter American Astronomical Society (AAS) meeting in Kissimmee! 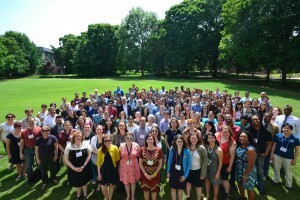 Several of us are attending the conference this year, and we will report highlights from each day here on astrobites. If you’d like to see more timely updates during the day, we encourage you to follow @astrobites on twitter or search the #aas227 hashtag. If anyone needed motivation to wake up early this morning, they got it — in the form of Feryal Ozel (University of Arizona) enthralling us all with exciting pictures, videos, and words about black holes and the Event Horizon Telescope. Ozel spoke to a packed room (at 8:30am!) about where the project currently stands, and where it’s heading in the future. The EHT has pretty much the coolest goal ever: actually image the event horizons of black holes in our universe. The problem is that the largest black hole we can look at (Sgr A*, in the center of our galaxy) has an event horizon size of 50 µas. For this kind of resolution — roughly equivalent to trying to image a DVD on the Moon! — we’d need an Earth-sized telescope. EHT has solved this problem by linking telescopes around the world, creating one giant, mm-wavelength effective telescope with a baseline the size of Earth. Besides producing awesome images, the EHT will be able to test properties of black-hole spacetime, the no-hair theorem, and general relativity (GR) in new regimes. Ozel walked us through some of the theory prep work we need to do now in order to get the most science out of the EHT, including devising new tests of GR, and performing predictive GRMHD simulations — hydrodynamics simulations that include magnetic fields and full GR treatment. Ozel pointed out that one of the recent theoretical advancements in GRMHD simulations is harnessing the power of GPUs to render images in simulations; check out the tweet below for the awesome video she showed us! Deployment of the full EHT array is planned for early 2017, and they’ve already got 10 targets selected — black holes that are near enough and large enough that the EHT should be able to image their shadows. I, for one, can’t wait to see the first results! One of Karen’s main takeaways is that academia is not automatically good preparation for a job search. Writing documents like cover letters, resumes, and research statements will be harder and take more time than you think, and it is important to make them top-notch. Karen was also surprised that the majority of professional astronomers at the AAS meeting carry backpacks, because she typically advises against bringing a backpack to a job interview or campus visit. She conceded that astronomy is an exception to this rule! I started my morning in a session near and dear to my heart on brown dwarfs. The session had four dissertation talks, showcasing each student’s (impressive!) work over the last 4+ years. Astrobites alumnus Ben Montet kicked off the session to talk about his recent work to study the eclipsing brown dwarf LHS 6343, discovered in Kepler data. This brown dwarf is one of the best so-called benchmark brown dwarfs that we have discovered. Unlike almost every other object, we can measure LHS 6343’s mass, radius, luminosity, and metallicity. Ben’s Spitzer observations reveal that it’s a ~1100 K T dwarf. Joe Filippazzo spoke next about his work to put together a large and impressive database of 300 brown dwarfs ranging in spectral type from M to Y, stitching together literature photometry, parallaxes, and both low and high resolution spectra. He studies the effect of age on the fundamental properties of these objects, empirically without needing models! You can download the database at BDNYC.org and use Joe’s open-source Python package astrokit which includes the SQL management tools to use the database. Jonathan Gagné presented results from his survey to find young free-floating objects in young moving groups. These objects are really interesting because they have the masses of planets but are easier to observe since they don’t have nearby stars. He is currently extending his survey from his PhD thesis to be able to find even cooler objects (literally and figuratively) in these groups. Sebastian Pineda gave a very interesting talk about his thesis work to understand auroral emission from brown dwarfs. Brown dwarfs with a range of temperatures have been observed to have both radio activity and H-alpha emission, despite their neutral atmospheres. These properties are believed to be generated by auroral emission — just like aurorae on Jupiter! One of many interesting results is that cooler objects have rare and weak aurorae. Sebastian postulates that these brown dwarfs may have aurorae that are modulated by the presence of satellites (brown dwarf moons?!). Very cool idea that needs more study! The last speaker of the session was the only non-dissertation talk of the session. Nolan Grieves presented results from his statistical survey of brown dwarf companions using the MARVELS radial velocity survey and finds a brown dwarf companion occurrence rate around 0.7%. Press stated that he strongly supports the top view, but it was eye-opening to see a nearly even split of raised hands. His point was that GMO labeling ultimately boils down to a value judgement, not a scientific one, and we should be careful to understand the difference. Science communicators certainly have our work cut out for us! In the broadest sense, Press’ takeaway for effective science communication is a two-step approach: (1) communicate the value of a rationalist approach to decision making, and (2) communicate well-established scientific results. Disclaimer: I’m an employee of the AAS, as editor of AAS Nova. Intro to AAS Nova — the AAS’s means of sharing its authors’ results with the broader community — by me! In between hopping between all the amazing science sessions today I made it to the last half of a very interesting Author & Referee Workshop run by AAS journals. Even with missing the first half, I can still tell that there’s a lot of changes coming to AAS journals (which include ApJ, AJ, ApJS, ApJL), in particular in the way that your research will be published. All good from what I saw — in particular they’ve addressed the long-standing problem of how to cite astronomical software (usually produced for free by a keen member of the community). Now they give guidelines for how to do this and have even appointed a new lead editor for instrumentation & software. The IA2015 meeting results can be found here. A draft of the recommendations from IA2015 is here. Note that this document, termed the “Nashville Recommendations,” is a living document that isn’t yet finalized, and feedback is welcome. Marc Kamionkowski of Johns Hopkins University and David Spergel of Princeton University shared this year’s Heineman Prize for outstanding work in astronomy, and gave an impressive tag-team overview of the progress in the field of cosmology over the past 20 years. Spergel pointed out that in 1995, cosmologists were still debating over the value of the Hubble constant, and whether or not the universe is flat. Kamionkowski pointed out that back then, cosmology was an “order of magnitude game” where observations lagged far behind theory. He noted that in general, theorists tend to “sit around predicting things,” and not much progress is made in testing those predictions, at least not within the lifetime of an individual theorist. In cosmology, however, the measurements and observations made since 1995 have been more successful and precise than anyone could have anticipated. This is thanks in part to the WMAP mission and later the Planck satellite, which measured the cosmic microwave background and collected an amazing set of data. There is excellent agreement between the data from WMAP and Planck, a triumph for observational cosmologists. Much to the surprise of Spergel and other cosmologists, a simple model of only five fundamental parameters fits these data extremely well. Twenty years later, thanks to the hard work of cosmologists, we now know that the age of the universe is 13.8 billion years, and that it is composed of roughly 4% atoms, 23% dark matter, and 73% dark energy. Spergel and Kamionkowski then pointed towards the future, predicting even more spectacular results to come over the next decade or so. Our current model of the universe predicts gravitational waves, which we haven’t observed so far, but the search is heating up. Kamionkowski called this potentially the most important new physics result of this century! He also explained that we can now do neutrino physics using the cosmic microwave background, which already provides the strongest constraint on the sum of neutrinon masses. In the next decade, we should be able to further determine the neutrino mass hierarchy. The coming years in cosmology could be even more exciting than the past twenty! 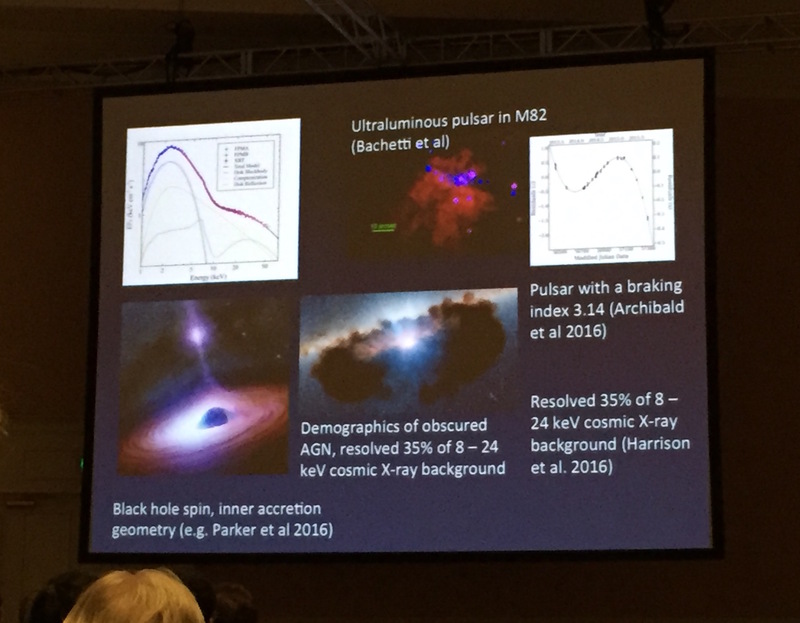 This year’s Rossi Prize winner Fiona Harrison capped off the main part of the day with a plenary talk about some of the highlights from the first two years of the NuSTAR mission, NASA’s space-based, high-energy X-ray telescope. Additional science results from the past two years with NuSTAR. Harrison began by telling us about NuSTAR’s launch in 2012, in which a Pegasus rocket — with NuSTAR as its payload — was launched from a L-1011 ‘Stargazer’ aircraft. She claims to have been unconcerned about this part: “The payload would go up or it would go down, there wasn’t anything I could do about it.” The real terror for the NuSTAR team came 9 days later when the telescope slowly unfolded itself over the span of 24 minutes, snapping components into place. All went well, however, and NuSTAR has since been forging exciting new territory in the high-energy X-ray regime! Harrison discussed science highlights from the last two years of NuSTAR, like the discovery of a population of dead stars in the inner parsecs of the galaxy, the identification of the mechanism that most likely re-energizes stalled shocks in supernovae and launches the explosion (in case you’re keeping track, it’s because the star sloshes around. Seriously. ), or the evidence that supernova 1987A exploded asymmetrically. NuSTAR is funded through the end of 2016 and is now in its extended mission, so we can expect to see more exciting science coming from it in the future!